A swirling bacchanalia of poetry, politics, and passion...expect a heart-pounding sense of being dropped into the crossroads of the world, within shouting distance of the descending ball! "Usually most comfortable playing loud and live with upraised fists and chunky guitar riffs in local hangouts – explodes with declarations of gnashing street poetry punctuated with wailing uilleann pipes, Joe Strummer-style chord chops and Bourbon Street sax sojourns." "Black 47 is as much a part of New York City as New York City is a part of Black 47." Sixteen years ago, when Black 47's breakout hit, FUNKY CEILI, was the most requested song on the then booming alt-radio format, Co-Directors Vic Zimet and Stephanie Silber sang along fiercely as it blasted from their speakers, but they could never have imagined that in the fullness of time they'd be producing a documentary about "The House Band of New York City." Subsequent to the success of FUNKY CEILI, Black 47 gained a devoted international following, and sustained itself steadily as a working band, recording regularly. 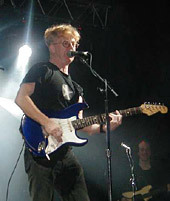 Over the years, Silber and Zimet had begun to follow frontman Larry Kirwan and the New York City based Irish roots-rock band, shooting interviews and B-Roll whenever possible, notably joining the band and three busloads of fans when B47 toured Ireland in 2003, all with an eye towards creating a long-form portrait of a truly indie entity. Thus, when Kirwan decided the band needed to capture the fire and fury of a typical gig for a DVD, he called on the filmmakers who knew them best. Kirwan, who is also a memoirist, playwright, and novelist, says, "Black 47 espouses an unblinkingly political and thoroughly Irish form of rock and roll, with songs covering topics from the Northern Ireland conflict to civil rights and urban unrest in contemporary New York. After almost two decades, we’re still dedicated to opening minds and hearts, living on the edge, and exploring the current issues while never forgetting the past." What began as a performance film, shot at Connolly's Pub in the city's most vibrant hub - Times Square - on that locale’s biggest day of the year, New Year's Eve, turned into something much more. Using early Black 47 footage, interviews with band members and the audience, and the riotous performance itself, the film weaves together a history of the band's beginnings, and by extension, a rich underlay of Irish-American history and the Diaspora. The viewer is treated to an up-close look at the musicians' artistic process, the true stories behind many of the songs, and the sometimes revealing close camaraderie of long-time colleagues. Expect a heart-pounding sense of being dropped into the crossroads of the world, within shouting distance of the descending ball, in a swirling bacchanalia of poetry, politics, and passion.